Logan Erickson (pictured) will soon head back to his village in Alaska will a new "leash'' on life, thanks to sled dog racers and a pet food sponsor. The 10-year-old boy has a severe case of autism, according to his parents, and can't be left alone in his hometown of Unalakleet, Alaska. The Bering Sea and many unforgiving dangers are 200 feet outside his front door. Search parties aren't uncommon in his life when he ventures off alone. But a new dog is about to help, say his parents, Jeff and Donna. Logan concludes his training Thursday with Juke, a yellow Lab trained to help children with autism. He has been training with Juke at 4 Paws for Ability near Dayton, Ohio since Sept. 14. 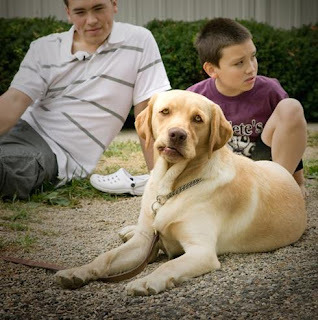 4 Paws claims to be the only non-profit organization training service dogs to help people with autism. The training involves tethering Logan to Juke when he's outside so he can't wander off alone. Juke is trained to calm Logan when he's unsettled by nuzzling him and is also trained to track him by scent. Dogs have a big impact on Logan, something his parents realized for the first time late last winter. He said his first word in nearly 7 years at the airport when he watched a family friend — Iditarod sled dog musher DeeDee Jonrowe — get on a plane with her dog, Miyagi. Logan said the word Miyagi. His family looked at each other, totally amazed. His mother told the Dayton Daily News: "There was a storm raging, the howling winds and the waves and the ocean sounds were so tremendous, I think that DeeDee's dog was a calming effect. When she left with that dog, he wanted that connection. It was painful for me because I had longed for so long for Logan to say something. It was very moving for me to know that he had a connection and that words can come out." Iditarod Sled Dog racers helped raise funds for Juke. Eagle Pack is paying for Juke's food. Logan is speaking more since he's met Juke. That's all the thanks anyone involved in this wonderful effort needs.